For the most part, vermouth is the territory of the Italians who invented it and the modern Americans who reinvented it—with one French exception: the ever-present Dolin. But as of this week, there are three great new French additions to the ever-growing market of craft vermouths. For the most part, vermouth is the territory of the Italians who invented it and the modern Americans who reinvented it—with one French exception: the ever-present Dolin. But as of this week, there are three great new French additions to the ever-growing market of craft vermouths. 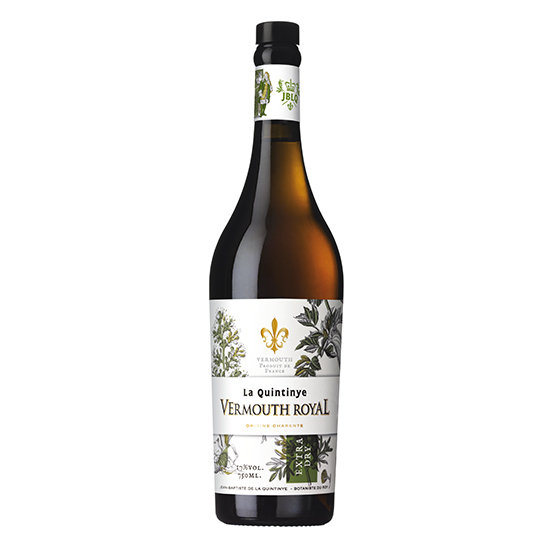 La Quintinye Vermouth Royal just released their Rouge, Blanc and Extra Dry vermouths stateside. And they all deserve a spot on your bar. Made without any added sugar and fortified with single-estate Cognac, the vermouths straddle the line between classic cocktail ingredient and stand-alone aperitif. The Blanc is floral, lightly sweet and a touch bitter—perfect for Vesper-style Martinis, which require a fruitier, full-bodied vermouth. The Extra Dry, on the other hand, is ridiculously herbaceous with nasal-clearing eucalyptus flavors and an almost savory finish. It’s a terrific pre-dinner drink on its own, but it would also be great paired with a new American-style gin packed with botanicals or even a grassy tequila. The Rouge is a fresh take on an old standby. While many of the newer craft red or sweet vermouths tend toward baking spices, this one almost comes off like a port. It’s heady with dried fruit flavors and honeyed sweetness. Great for after-dinner sipping, it would also make for a crazy-rich Manhattan. All three bottles retail for $23 for 750 milliliters or $15 for 375 milliliters.